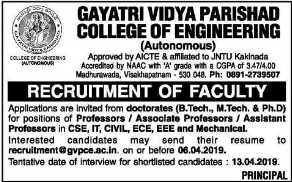 Gayatri Vidya Parishad College of Engineering Jobs 2019: Gayatri Vidya Parishad College of Engineering has published a recruitment notification for Associate Professor/Professor/Assistant Professor Vacancies. Associate Professor/Professor/Assistant Professor jobs you can apply Online. Eligible candidates can apply online from 27-03-2019 to 06-04-2019 for Gayatri Vidya Parishad College of Engineering Associate Professor/Professor/Assistant Professor posts. Eligible Applicants can send the Updated Resume to College Mail-id are given below. Further Details can refer the official website www.gvpce.ac.in. Remaining details like Salary, Important Dates, Availble Vacancies, Qualification e.t.c are given below. Starting Date to apply for GVPCE Associate Professor/Professor/Assistant Professor Jobs: 27-03-2019. Ending Date to apply for GVPCE Associate Professor/Professor/Assistant Professor Jobs : 06-04-2019. Eligible Applicants can send the Updated Resume to College Mail-id to maintained below.